Sampling is a process used in statistics when it’s unfeasible or impractical to analyse all the data that exists. Instead, a small, randomly selected subset is used to keep things manageable. 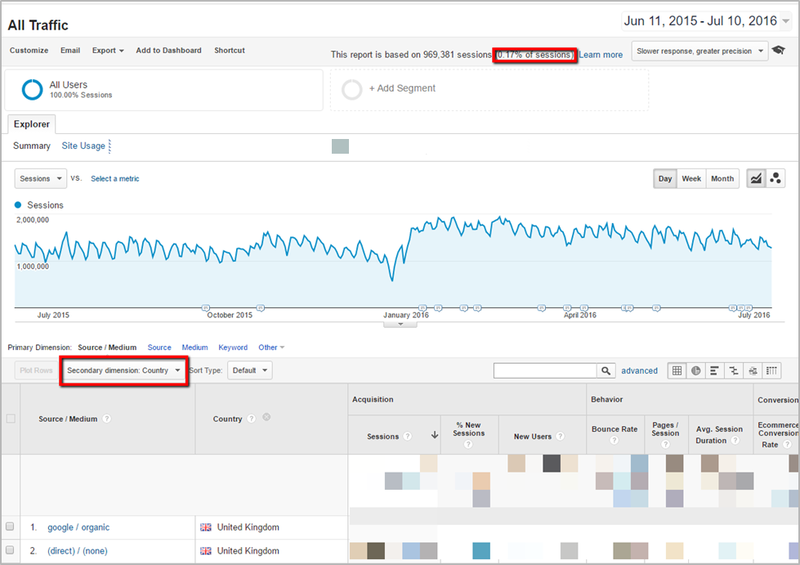 Many analytics platforms use some sort of sampling to keep report loading times in check, and there seem to be three schools of thought when it comes to sampling in analytics. There are those who are terrified of it, insisting in unsampled versions of any report. Then there are those who are relaxed about it, trusting the statistical logic. And then, lastly, there are those who are oblivious. 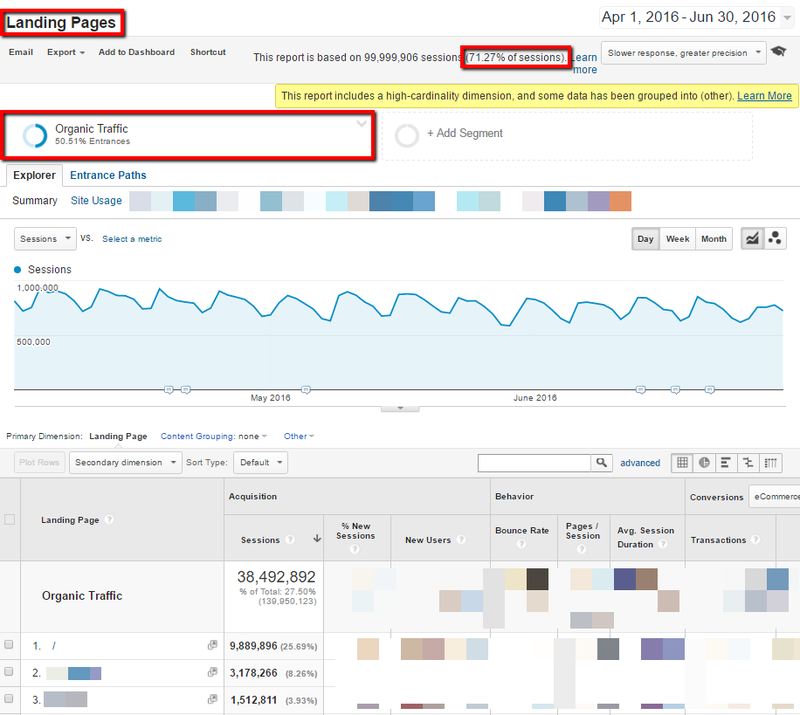 Sampling isn’t something to fear, but, in Google Analytics in particular, it can’t always be trusted. Because of that, it’s definitely worth your time to understand when it occurs, how it affects your work, and how it can be avoided. The two are identical apart from the use of a segment in the second case. 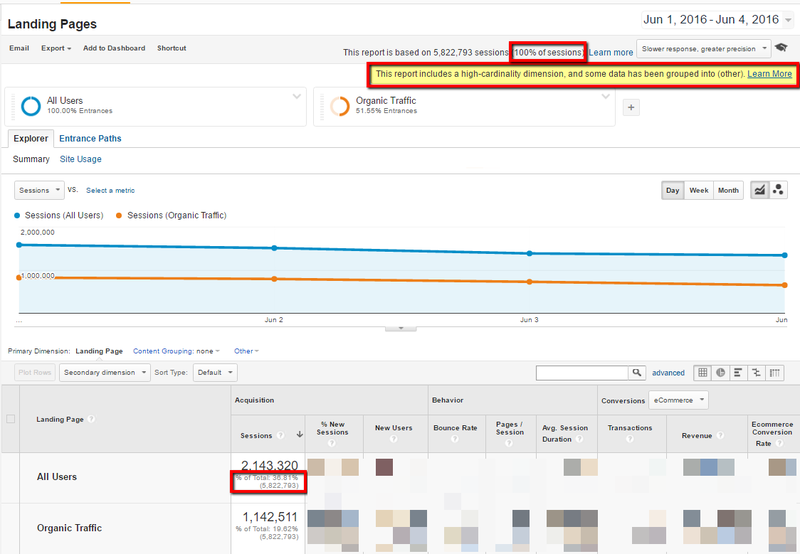 Google Analytics can always provide unsampled data for top-line totals like that first case, but segments in particular are very prone to prompting sampling. The difference is just 2.4%, from a sample of 0.17% of actual sessions. Interestingly, when I repeated this comparison over a shorter period (last quarter), the size of the sample went up to 71.3%, but the margin of error was fairly similar at 2.3%. 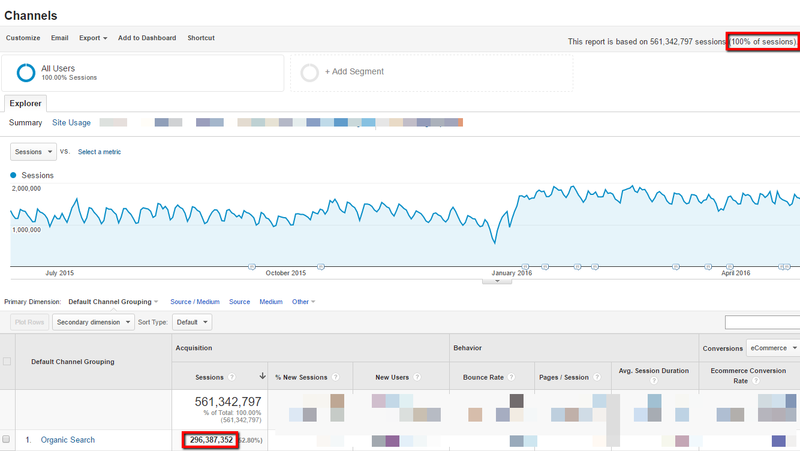 Eight percent of a whole year’s traffic to Distilled is a lot, but 8% of organic traffic to my profile page is not, so we end up viewing a report (above) based on 45 visits. Whether or not this should concern you depends on the size of the changes you’re looking to detect and your threshold for acceptable levels of uncertainty. 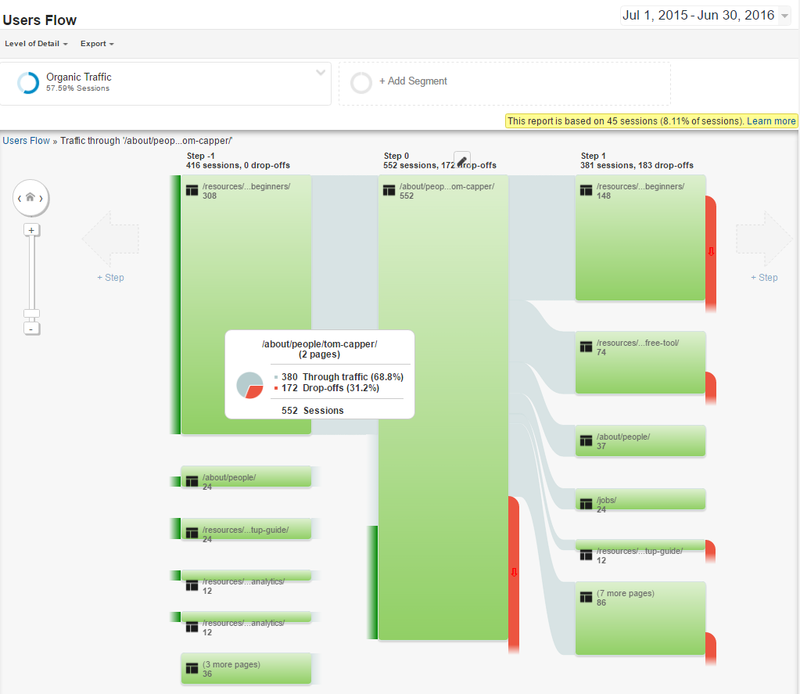 These topics will be familiar to those with experience in CRO, but I recommend this tool to get your started, and I’ve written about some of the key concepts here. In extreme cases like the one above, though, your intuition should suffice – that click-through from my /about/ page to /resources/…tup-guide/ claims to feature in 12 sessions, and is based on 8.11% of sessions. As 12 is roughly 8% of 100, we know that this is in fact based on 1 session. Not something you’d want to base a strategy on. There’s no sampling here, but the number displayed for “All Users” in fact only contains 38.8% of sessions. This is because of the combination of there being more than 1,000,000 rows (as indicated by the yellow “high-cardinality” warning at the top of the report) and the use of a segment. This is because of the effect of those rows grouped into “(other)”, which are hidden when a segment is active. Regardless of any sampling, the numbers in the rows below will be as accurate as they would be otherwise (apart from the fact that “(other)” is missing), but the segment totals at the top end up of limited use. Sampling is generally pretty accurate (+/- 2.5% in the examples above). When you’re looking at small numbers in reports with a high level of sampling, you can work out how many reports they’re based on. For example, 1% sampling showing 100 sessions means 1 session was the basis of the number in the report. You should keep an eye out for that yellow high-cardinality warning when also using segments. This takes me to a report where I’m only looking at organic search sessions, and I can pick a primary dimension of my choice — in this case, Landing Page. It’s worth noting, however, that this trick does not function reliably — when I replicated the same method starting from the “Source / Medium” report, I still ended up with sampling. 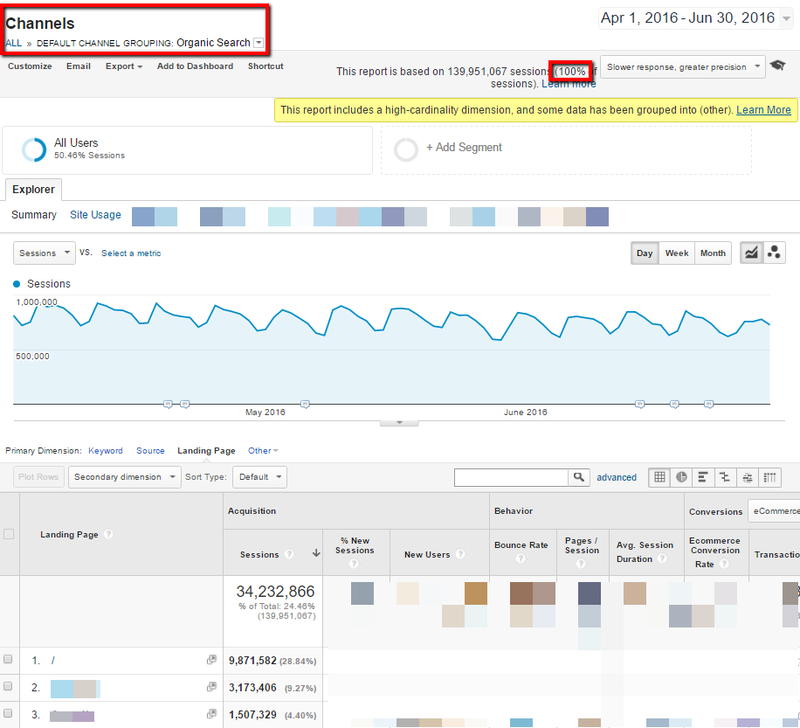 Secondly, you can use the API and Google Sheets to break up a report into smaller date ranges, then aggregate them. My colleague Tian Wang wrote about that tool here. You can construct reports differently to avoid segments or secondary dimensions and thus reduce the chance of sampling being triggered. You can create duplicate views to show you subsets of your data that you’d otherwise have to view sampled. 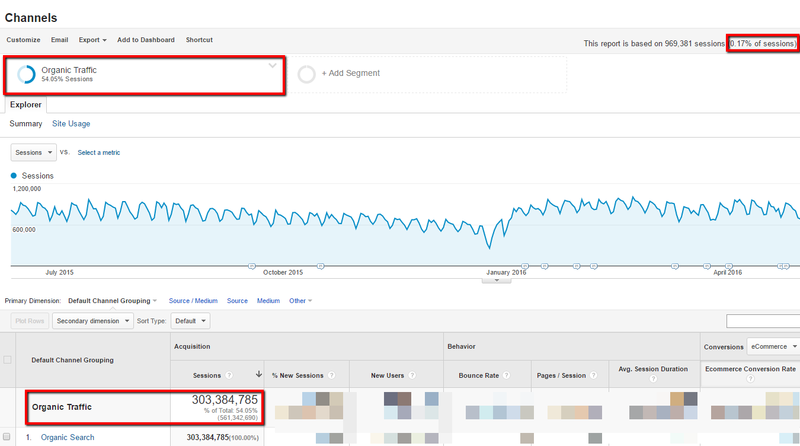 You can use the GA API to request large numbers of smaller reports then aggregate them in Google Sheets. 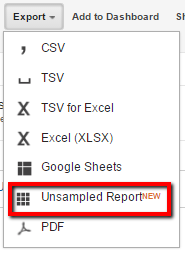 For larger businesses, there’s always the option of GA Premium to receive unsampled reports. I hope you’ve found this post useful. I’d love to read your thoughts and suggestions in the comments below.